Also held at the Rinks at Shelton, I signed Duncan up for the 8 week program as a bridge between the end of his regular season with the Avon Development Program and the start of spring hockey with the CT Werewolves in 2014. There would be a couple of weeks of overlap but that didn't really concern me too much. So this program was dubbed as a series of hockey skills sessions for the beginning hockey player so I assumed it would be essentially just more of the same type of thing that he'd been doing for months. And...it was. 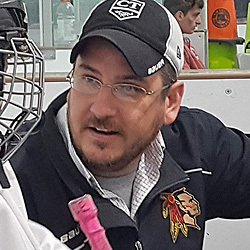 The downside was that it was the same group of coaches (plus a few teenage hockey players helping out) that had run the Tiny Tigers program that he'd been enrolled in a year prior. And, as luck would have it, for three of the first four weeks, Duncan landed in the group led by the coach who clearly wasn't suited to be coaching young children. Duncan held his own... but also experienced being a victim of an on-ice bully for the first time which made him less than enthusiastic to take the ice each week. As the weeks went on, the "real" coaches kinda disappeared and the high school kids took over doing fun stuff with the kids like practicing goal celebrations, one of which Duncan still uses. Anyway, I think this program was worthwhile, far better than the Tiny Tigers experience, but Duncan just ended up in a less than desirable group. Incidently, the Tiny Tigers program ran at the far end of the ice at the same time as the Little Islanders and for this session, it *was* filled with children who were only just beginning. Seems we just caught a bad session...twice.